It took a while, but Earthwise is now selling Grassfed Beef! Back in 1983 Thomas Harr, co-founder of Earthwise Organics, began farming “organically” on a small piece of land in South Texas. There was a handshake deal to produce fresh “organic” vegetables for Texas Health Distributors, an Austin based wholesale buyer of natural foods. This was in the days before their was any law or even regulatory framework concerning the word “organic”. Texas Health supplied natural food stores and restaurants, but the main customer for Texas Health (and its business partner) was a brand new health food store you may have heard of – Whole Foods Market. After 5 years of hit and miss truck farming (we would call it market farming nowadays), Thomas moved on to other projects, and eventually co-founded Earthwise Organics 1n 1996. As noted in ABOUT EO, for many years Earthwise has been in the business of serving agricultural producers with an emphasis on organic/biological production. Several years ago we decided that we wanted to directly participate in the production of natural foods again. It seemed to us that raising cattle was something we could manage while still operating our business full time. 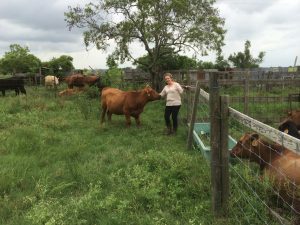 So we bought 21 crossbred South Texas calves from a local rancher and a Red Angus “prize bull” from Pharo Cattle out of Colorado. Since then, by acquisition and breeding we have accumulated 50 momma cows along with steers up to 4 years old. Though we are not certified presently, we follow American Grassfed Association standards – see here for full standards. 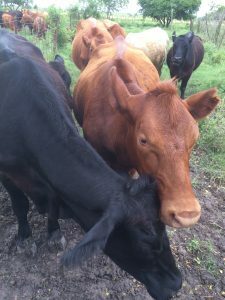 We decided to raise and sell grassfed cattle for a variety of personal reasons including animal welfare, nutritional quality of meat and broth, impact on the environment, and flavor of the finished products. For more info on some of the reasons the nutritional quality (and other characteristics) of well managed grassfed beef is considered superior to grainfed beef, see here, here, and here. 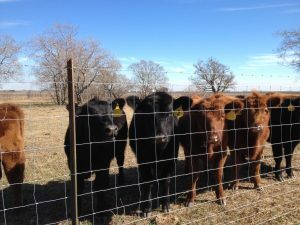 In the conventional cattle industry most cattle are processed for the prime/choice/select USDA graded market at about 18 months to 30 months of age. Generally, the longer you keep an animal the more cost is associated with it. This market and business reality is why producers like to process cattle at the earliest marketable age. After a lot of conversation and research, and some experience, we have decided that the animals we sell for retail consumption will be 4-6 years of age. The reasons for this have to do with the flavor and the tenderness of the grassfed animal. We hope to sell a superior product that will cause customers to seek us out for future purchases. See our grassfed commerce page for more info about our processor, available cuts, logistics of delivery, and of course, pricing!